Shawn Liotta is the offensive coordinator at Clairton High School (PA), a team which averaged 59.9 points per game last season. Clairton also averaged 12.8 yards per play and 510 yards in total offense per game, even though the PIAA Mercy Rule was in effect in the second half of 12 of the 16 games his team played. His offense is aptly named the ‘No-Huddle, No Mercy’ offense. Along the way, Clairton’s quarterback, running back and wide receiver each set school records last fall. Liotta’s team became the second highest scoring offense in the history of high school football by amassing 958 points over their 16-game schedule. 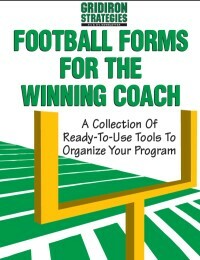 Coach Liotta recently completed a five-set series of DVDs, now available at AFMvideos.com. 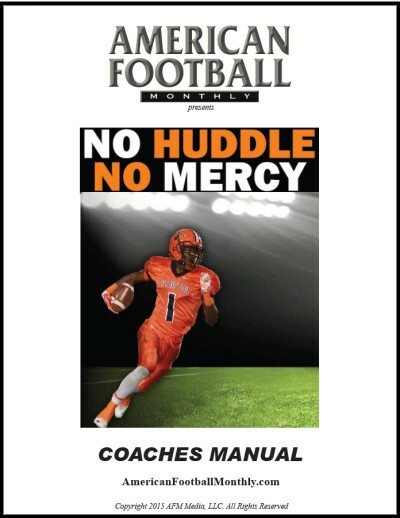 This includes, ‘Playing Fast and Winning Big,’ ‘The Run Game,’ ‘The Pass Game,’ ‘Screen Package,’ and ‘Game Planning and Play Calling.’ All DVDs include clinic presentations, game video and white board diagrams. What defensive fronts cause you the most problems and what coverages present the biggest challenge to your quarterback and receivers? Lee Branthover, Assistant Coach, Georgetown Prep (MD). It is important that your offensive scheme have answers for whatever defensive front and coverage your opponent may utilize each week. In the No-Huddle, No-Mercy Offense we have built in answers for any front or coverage that we may see from week to week. We control the numbers that we see in the box with our formations and built in screens and quicks. 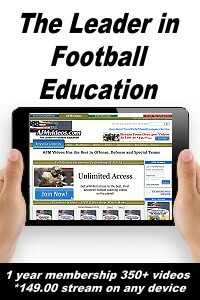 This allows us to handle even or odd fronts in the run game and in our pass protections. We use multiple pass protections and launch points to handle the blitz and most of our concepts have built in hot routes for the QB to deliver the ball against the blitz. In 2014 we saw teams that tried to apply pressure to slow us down and teams that only used one or two down linemen with nine players aligned off the line of scrimmage in an attempt to confuse our blocking schemes. So, to answer your question, there is not one front or front/coverage/pressure combo that gives us more problems than another. We will simply adjust our plan of attack to use a concept that works well against the defense that is being deployed. Where considerations come into game planning is when we feel that we do not match-up in a one-on-one situation up front. There could be a defensive end going into the game that we know is going to be a problem for our tackle in a one-on-one situation so we will try to neutralize that but screening him, double teaming him, chipping him with our RB in pass protection, and running all influence plays to attack him. In terms of the backend of the defense, we practice each of our pass schemes vs. open and closed field coverages, and man and zone techniques. We drill and teach our players how to defeat these coverages and where the holes or the “grass” exists as they work to get open. It is extremely important for any team running a spread passing game to work defeating man coverage and press man coverage. You must teach and work with your receivers on how to get proper releases to defeat press man coverage. 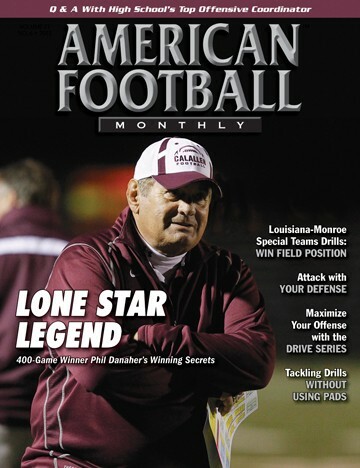 How do you attack a 4-2-5 defense with split field coverage; that is, cover 2 read, quarters, robber and man? Scott Weissman, Co-Defensive Coordinator, Parkway West High School (MO). The 4-2-5 has been a common defensive look utilized by teams looking to defend the spread but they often keep a six-man box with a two-high shell in the secondary. This was a common defensive alignment we saw last season. It is important that you have answers for and attack the “grass” or the weakness in the defensive structure. It is a simple concept but cannot be overstated when game planning and calling plays on game day. We would take a look at your personnel in the secondary and see what type of an athlete your nickel player was. Is he a cover-guy, strong safety type, or Will linebacker? This player is usually the key to this defensive structure vs. the spread especially when we get into our deuce personnel or trips alignments. We will then look to attack this player and force him to do things he is not comfortable doing (e.g., cover guy – tackling, force player – covering). Most coordinators running this scheme will want to maintain the six-man box to defend the running game while keeping a two high shell. The spread of our formations coupled with our extensive use of the jet sweep and quick screens to our receivers will force them to either remove a linebacker from the box to cover down on our receivers or invert a safety. If they remove a linebacker to cover down on our WR and maintain a two high shell, we will have a field day running the ball against a five-man box. If they maintain the 4-2 box and do not cover down on our receiver alignments, our screens and quick game will eat up yardage quickly. How do you deal with referees who feel it is their responsibility to slow the game down so that the other team can get themselves lined up? Tracy Jackson, Head Coach, Dallas High School (OR). We stress to our players that we can only play as fast as the officials will let us. It is important to mention to the officials in the pre-game meeting that you are a fast-paced, no-huddle team and we would like to have the ball spotted as quickly as possible. We also have our players get the ball to the official as quickly as possible after the play and we have our ball boys quickly cycle new footballs in and out of the game. We try to make the officials job as easy as possible in getting the football spotted and ready for play each snap. One thing that we have fun with our players in film review each week is charting how many times we are able to gain a first down and snap the ball before the lead stick is placed down by the chain crew. What practice drills do you see as the ‘must do’ drills in order to incorporate your style of the ‘No-Huddle, No-Mercy’ offense? Brian Spicer, Head Coach, Woodmore High School (OH). There are two drills that we do daily that are critical to the execution of our offense. The first is our mesh drill that we do each day for 10 minutes in pre-practice that stresses our timing, faking, and exchange on our jet series plays. The second drill is our screen drill which allows us to throw all of our screens to both sides of the field in a half line and team setting in a 10-minute period. We will average 60-80 snaps during this period. Screens are an important part of our offense and we treat the screen game the same as we do any facet of the attack. The Screen Drill for your screen game is no different than your inside run period for your running game. It is essential to executing these concepts at a high level. 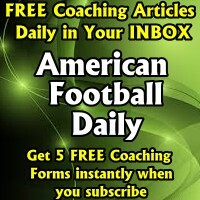 Video of both of these drills are available now for free at nohuddlenomercy.com. We try to limit the number of concepts that we have to ensure that we are able to execute them quickly and effectively. 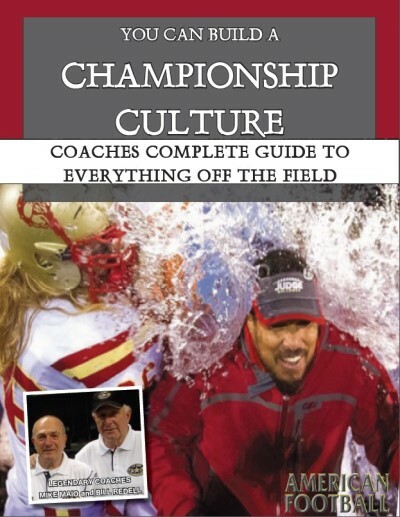 I think it is imperative of you as a coaching staff to determine what your kids can handle from week to week. Often, if something is added to the game plan, you must take something away. We have some concepts that we only practice or run in one direction or from one alignment. This is to cut down on teaching time and to increase the amount of reps we can get perfecting the concept. It is important to get enough reps of each play against multiple fronts and coverages so that your players will gain mastery of their assignments. This truly allows you to play “fast.” A player who is unsure or thinking will not execute at the tempo that we need him to. We want to ensure that we are fundamentally sound in all of our concepts that we use each week. I like to think of our concepts as tools in a tool box, where we have something to fix any problem that might arise on game day. If we have too few tools (plays) we may not be able to solve the problem, and too many tools (plays) and we may get confused or make mental mistakes. One of the keys to installing this offense is the pace that you must set while practicing to prepare for success on Friday night. We want to create an extreme up-tempo atmosphere that will make the actual games appear to slow down for our players. I would like to see the process of the installation days with plays. Also, what is the process of installing the screen and play packages? Martin Asprey, Head Coach, Grassfield High School (VA). I would run the “No-Huddle, No-Mercy Offense” and try to out-score us! All joking aside, the key is having talented players, play sound fundamental defense, be in great shape, and tackle well in space. So much of what we do is in open space and if you miss a tackle, it often leads to a big play or touchdown. You also must decide how you are going to handle the run pass options. Are you going to load the box to stop the run and allow us to move the ball up and down the field with quicks and screens, or are you going to give us numbers in the box and allow us to run the ball? If your defense is not in great shape, this tempo will cause problems particularly in the second and fourth quarter. It is also extremely difficult to simulate the speed at which we operate with your scout team defense in practice. We had several teams indicate to us that by the time their players were able to catch-up to the speed at which we were operating, the game was already decided.